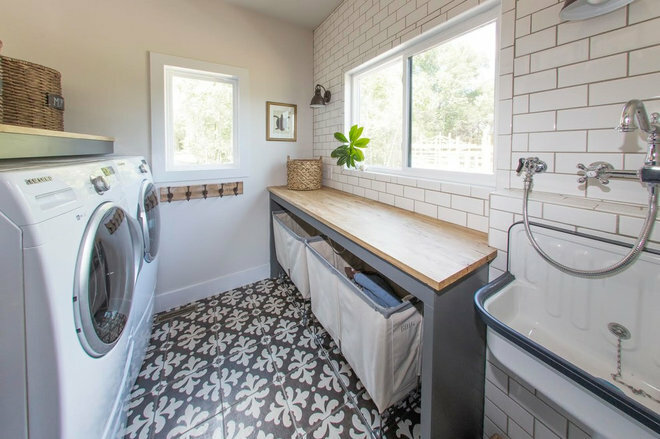 Check out this dream laundry room design by Sharon & Jeremy Barret. Sharon and Jeremy Barrett have lived in six houses in the past nine years. Along the way, Sharon, a designer, made notes of what did and didn’t work in each home. As the couple built their new (hopefully forever) home, Sharon became her own client as she designed the laundry room of her dreams. She drew out the plans for the room, allowing for enough space to do laundry and crate the dogs while away. See how they changed their laundry room into organization heaven.